Static and fatigue analysis on the Sonaca 200 has been performed under Sonaca's SONIA virtual sizing environment Sonaca Aircraft is currently in the final phase of the Sonaca 200 flight test program The delivery of the first Sonaca 200’s is scheduled for the beginning of 2018. The static and fatigue analysis for the Sonaca 200, a single-engine two-place airplane designed for training and leisure use, were undertaken entirely within the SONIA environment. 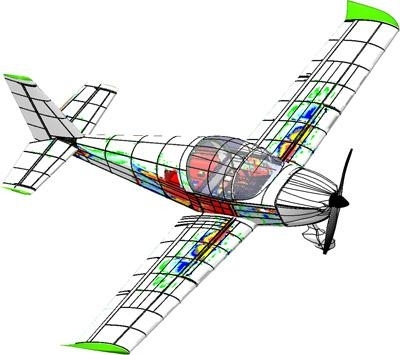 SONIA is a structural computing environment that has been developed by the aerospace equipment manufacturer Sonaca, and embed the best computation software using the finite element method (SAMCEF, ABAQUS or NASTRAN), as well as sizing methods developed over more than 40 years by Sonaca's design office. "SONIA automates and standardizes our sizing process. It covers structure idealisation, load application, launch of analyses as well as result post-processing according to design requirements", said Albert-Paul Gonze, Head of Sonaca's "Numerical Methods" team. This approach has been developed over more than 15 years and has been validated by numerous tests. It is used for certifying Sonaca aircraft. It allows innovation in the design of aircraft and more efficiency in terms of weight reduction. "SONIA is able to solve very complex problems such as impact resistance, de-icing, non-linear behaviour, large deformation, fatigue analysis and damage tolerance, etc. ", Albert-Paul Gonze says. "We naturally turned to Sonaca for the sizing of the Sonaca 200. The Sonaca Group has significant experience in the sizing and certification of aeronautical structures for CS-25 category aircraft whose certification criteria are much more stringent than those for the Sonaca 200", said Carl Dewandel, Head of Structure Compliance at Sonaca Aircraft. "In the specific case of the Sonaca 200, the digital model included the 800 parts and 15,000 rivets that make up the plane. SONIA has made it possible to precisely calculate the safety coefficients and to maximise the reliability of all the elements ". After successfully passing the static test program as well as all stability, noise, vibration, performance and stall tests, the Sonaca 200 begins the final flight-test phase (spin test). Sonaca Aircraft completes the steps to obtain DOA. Delivery of the first aircrafts is still scheduled for the beginning of 2018.